A record-setting sprint around 60 Scotch whisky distilleries in one day has raised well over £10,000 for charity. 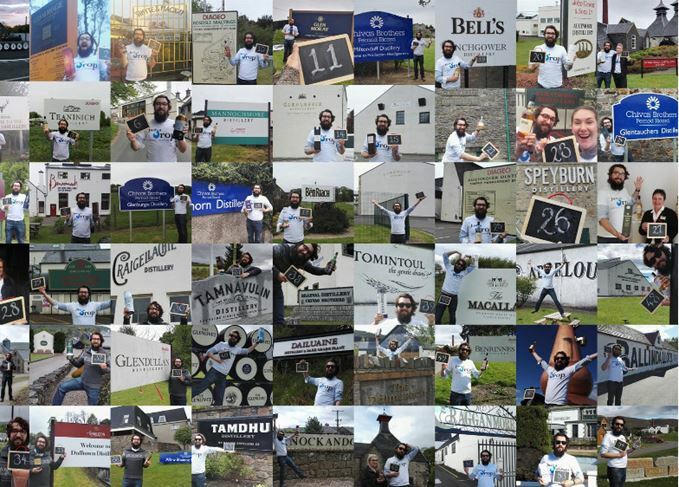 The Great Whisky Distillery Challenge, a collaborative effort between World Whisky Day founder Blair Bowman and Just a Drop, a charity that works to provide clean, safe and accessible drinking water to deprived communities, took place on 15 May. Bowman and his team set off at sunrise, starting at Balblair distillery in Ross-shire and ending at sunset at Aberfeldy distillery in Perthshire. A total of 55 whisky bottles were collected along the way from distilleries that bottle their own spirits, and collectively put into a raffle – tickets for which cost £1. The winners were drawn last Friday (2 June), with Mike Jackson from Salisbury winning the entire haul of 55 bottles. Other winners included Nikki Welsh and Michel Polton from Edinburgh, who both received a four-day whisky tour to Speyside; Jonathan Webb from Bristol, who won a photographic print of Leith; Nicola Swann from London, who won an engraved whisky stave; Brian Atkins from Devon, who won whisky tasting glasses; and Michael Farley from New Jersey in the US, Charlotte Farndale from Penicuik, Alasdair Milton from Aberdeenshire, Mak Salha and Richard Wheatley from London, Andrew Burgess from Middlesborough, and Linda McDonald from Edinburgh – who all received a copy of Bowman’s new book, The Pocket Guide To Whisky. Like whisky, the late musician’s music was truly creative in its simplicity, writes Dave Broom. The Bourbon festival has also tapped Led Zeppelin frontman Robert Plant and rock duo Hall and Oates. The soulful singer was famous for his love of single malt, sharp suits and cigarettes. Does music modify the taste of whisky? Glenrothes is conducting an experiment to determine whether music affects how people taste whisky. A Highland distillery is offering all-expenses-paid placements to women ‘from all walks of life’.